Quick and easy dinners are the best. They’re uncomplicated and if done right, with good creativity, they can turn out amazing. And this is why I have created a compilation of 5 five ingredient dinners. No huge list, that just takes longer to look through (and makes it harder to decide). I know a lot of us have very busy lives or like to have a lazy night, so it’s a plus if we can have a few quick go-to recipes that don’t cost much money and can produce something great quickly. Especially if we’re feeding more than just ourselves. I’m not sure whether it’s the fact that it’s so simple that makes it the best or that it has bacon in it. Probably both. 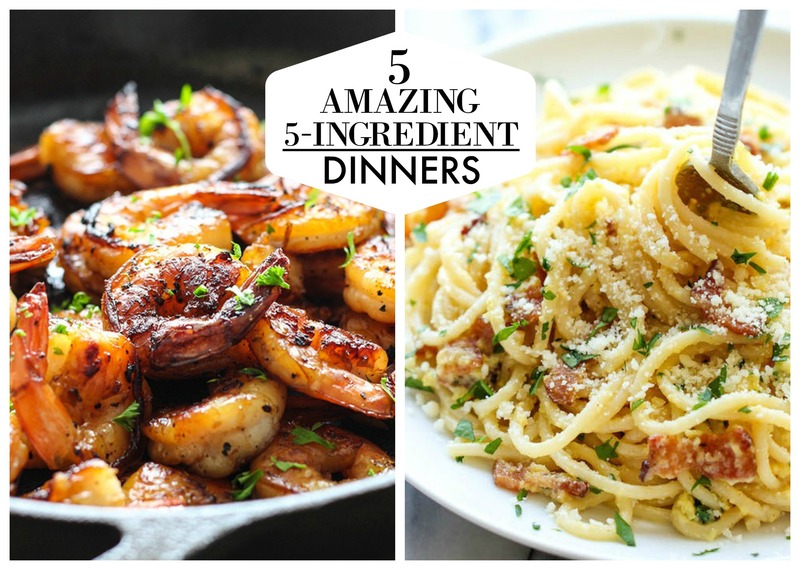 This five ingredient dinner is a great option if you’re having pasta cravings and probably not on a diet. This recipe by Chungah serves 4 and is done in just 20 minutes. Now there’s no excuse for you to to put a frozen pizza in the oven when there’s something this good that can be made on the stove top. For those of you who love seafood,this is probably something you should add to your easy go-to arsenal. Add rice or noodles to this (I guess that would make this a 6 ingredient dinner), and you’ll have an amazing quick meal. I found this recipe done by Farah from The Cooking Jar and have to give her credit for great this looks and tastes. Serving 4, you can either share it with friends/family or share it with yourself… over a couple of nights. Because leftovers are also great meals to have when feeling lazy. This colorful masterpiece was done by Brooke McLay, and I have to say, those sauce drenched noodles are making me hungry. Serving 4, it’s simple, but bright and delicious, and packs you with protein and a mouthful of noodles. A quick side note: unless you’re purchasing already pre-made peanut sauce, there is an extra recipe at the end that shows how to make it yourself (which would not make it just a five ingredient dinner). But if you want to stick to the quick and easy, you can find peanut sauce at any grocery store (but I’m sure adding just a couple of minutes to the cooking process probably isn’t going to mean much to you anyway). I love oven baked noodles, there’s something so right about their texture and the fact that I don’t have to keep on eye on them as they cook. Also, I’m not so sure as to why I’m giving you so many recipes with noodles in them. Probably because they’re easy and so darn good. Done by Ali from Gimme Some Oven, it serves 6-8 which means either more for you and your family (or friends), or just you. So if you’re craving Italian one night, make sure you have this as one of your go-to’s in your quick and easy five ingredient arsenal. Another recipe by Give Me Some Oven, these quinoa stuff bell peppers are so easy and delicious. Oh, and it’s not just another pasta recipe, so for those you who are looking for something quick but healthy, then this recipe is for you. If you need your protein, quinoa is a great go-to grain (not to mention it has a lot of other vitamins in it). Stuffed bell peppers are one of my favorites; it’s packed with flavor and simple to make. All you need is to let the oven do most of the work for you. I hope you were able to find a recipe that worked for you, and if you have any five ingredient recipes that you like, email them my way or give me a link in the comments below!